Looking at how scenography has traditionally been conceptualized, we basically find two levels of abstraction and analysis: one concerned with “objects,” rather generally—theoretical, detached, and fairly recent—and one, with the more pragmatic vocabulary of scenery, props, and perhaps costume. A proponent of the former, semiotician Patrice Pavis notes the “difficulty of drawing a definite boundary between the actor and the surrounding world” as a basis for using object as the analytical term, “neutral [and] empty,” as opposed to the baggage of tradition carried by props or scenery. Part of a “Western cultural heritage,” he deems the latter terms somewhat “antiquated,” and in the event of performance, these alleged categories do indeed easily morph into one another, as many a theatre scholar has effectively argued.1 However, this proclivity to overlapping definitions pertains to the more abstract and more concrete terminologies, in equal measure. To illustrate their difference, one can really only refer to what one takes to be typical examples. To set up much of what I shall argue in this chapter, table 1.1 provides such examples from semioticians Shoshana Avigal and Shlomith Rimmon-Kenan, on the one hand, and from psychologist James J. Gibson, on the other. 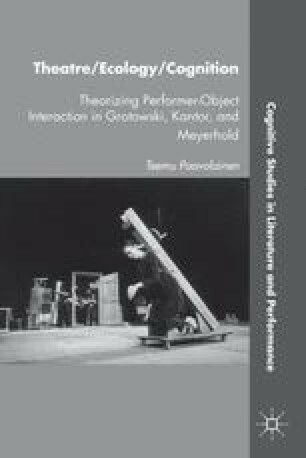 While the former focus on theatrical objects, and the latter on objects in general, their respective approaches appear representative enough when it comes to divergent levels of abstraction, in how we may choose to conceive of an object.